We're happy to have Tracey Neithercott stop by to share more about her debut novel, GRAY WOLF ISLAND. 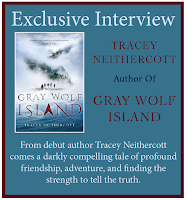 Tracey, what was your inspiration for writing GRAY WOLF ISLAND? It started with Stand by Me. I was watching it (again) one night, and just as Chris was pouring his heart out to Gordie, I realized how much I wanted to write a YA friendship story. I didn’t have anything as fancy as a plot, but the idea wouldn’t let go. And then it hit me: I wanted to send a group of characters on a treasure hunt that would forge intense, lifetime friendships. A couple weeks later, my husband began watching The Curse of Oak Island on the History channel. It follows the real-life treasure hunt on a small island off the coast of Nova Scotia, where an endless pit is said to hold a massive treasure. It was so perfect I swear I heard a “click” when the two ideas slid into place. Gray Wolf Island deals with a lot of dark topics, so there were a few chapters that I found really tough to write. The hardest by far was the prologue. It took me a very long time to write that single chapter—probably twice as long as the first ten chapters combined. It was a really emotional scene, and I remember making myself cry to get into the main characters head then, when it was finished, being unable to stop. In the end, it’s definitely one of the scenes I’m most proud of. Fun fact: This scene barely changed from the first draft to what you’ll read in the finished book. How long did you work on GRAY WOLF ISLAND? It felt like I spent a literal eternity writing this book. I started the first draft at the very end of 2014 and sent the finished draft to my agent on Oct. 11, 2015. ( I didn’t realize until this very minute that my book released almost exactly two years from that date.) I did a couple revisions, waited out the holidays, and went on submission to editors in mid-January. The book sold two months later, and then came more revisions with my editor. After the absolute angst of drafting the book, I kind of enjoyed all of those rounds of revisions. I’m forever envious of authors who can speed through a draft. I tried that, desperately. But in the end, I’m not very successful at shutting down my inner editor and the idea of a messy first draft leaves me a ball of stress. This book was the first to show me that I’m not broken; I’m simply slow. It also helped me see that my process isn’t all terrible. Drafting might take an eternity, but revising is a breeze. As I'm drafting my next novel, I keep looking back at Gray Wolf Island for that reminder. Gray Wolf Island was the third book I wrote and the first I sold—thankfully. My first book helped me meet great writer friends and introduced me to the YA community, but it wasn’t ready in the least. I stopped querying it once I got a few chapters into my next book. That, I realized, was infinitely better than the first—and it’s the book that eventually got me my agent. Months later, when my agent mentioned sending that novel out to a second round of editors, I asked to pull the plug. I know. But after writing the first chapter of Gray Wolf Island, I knew it was The One. I’m not sure whether this means I give up easily or trust my gut. Either way, it worked out. I’m still waiting for that aha moment. I’m not even sure you can learn the key to writing a novel—or that there’s a single key that will unlock the secret. For me, each novel is a learning experience. The novel I’m writing now has challenged me in ways Gray Wolf Island didn’t, and I’m sure my next novel will stretch my writing in a completely different direction. I have a day job, so all of my writing gets done at night or on weekends. I find words and lyrics distracting, so no public places or music for me. Instead, I have a very specific at-home ritual: I pour a cup of tea or coffee, put on a face mask, and turn on my Brainwaves app. I use the Creativity setting with the ocean waves ambiance, and it keeps me focused. (I was skeptical, too, until I tried the app—it works. Or the placebo effect works.) A new trick I’ve been using is to write in Scrivener’s full-screen mode with an inspiration image as the background. It keeps me in the zone. Make friends with other writers. These are the people who will commiserate with you over rejections, who will hold your hand while you’re querying agents or submitting to editors. They’ll cheer for you over good news and be your biggest supporters when your novel sells. The writer friends I made years before my book ever sold—years before I ever got an agent—are the same friends who I turn to when I’m stressed or excited. Plus, debuting beside friends make the entire process more exciting. I’m drafting a modern fantasy novel that I’ve been describing as Rumpelstiltskin, if Maleficent was the miller’s daughter. Tracey Neithercott’s first book was written by hand and illustrated with some really fancy colored pencils. It was highly acclaimed by her mother. Now, she writes YA stories of friendship, love, murder, and magic. (None of which she illustrates—you’re welcome.) She lives in Massachusetts with her husband, who suggests improving her novels by adding Star Wars characters. She is the author of GRAY WOLF ISLAND, a YA novel about the truth, a treasure, and five teens searching for both. Coming fall 2017 from Knopf/Random House. 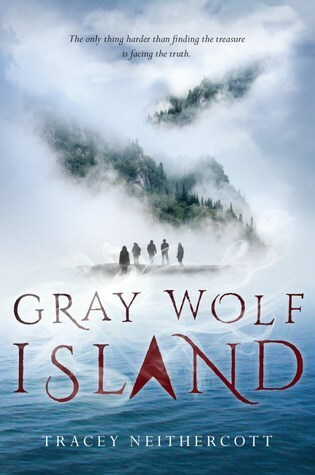 Have you had a chance to read GRAY WOLF ISLAND yet? Have you written a novel inspired by a movie you love? Have you tried any of the brain apps for boosting creativity? Free #1st5pages Workshop Opens November 4th!